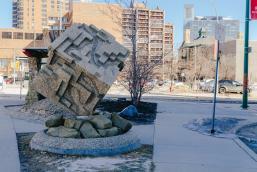 Winnipeg presents so many opportunities to be inspired, especially in the way of public art. There’s a sense of pride that comes with a newly installed piece of public art, and a feeling of nostalgia when reflecting upon an older one. 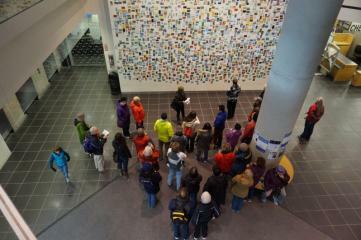 Public art enhances the space it occupies. It connects people to their communities and creates a feeling of belonging. There is no entry fee and no dress code for this come-as-you-are experience. What’s more, public art plays an essential role in shaping our culture, narrating our past, while anchoring us in the present. 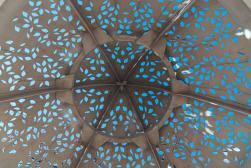 Here are some of the city’s displays of public art. 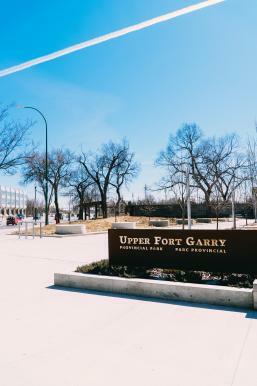 The Upper Fort Garry Provincial Park was created in an effort to preserve a significant part of Manitoba’s history, and has become one of the most noticeable displays in the city. 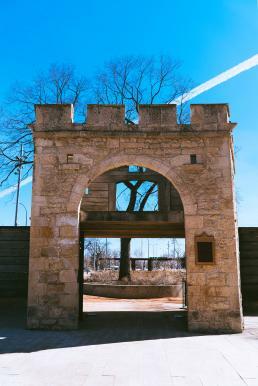 While the only thing left of the original structure is the gate, the 400-foot-long Heritage Wall, which is made of steel with lighting installed throughout, recreates much of what has been lost, and marks the height, depth, and location of the original wall, demolished in 1880. 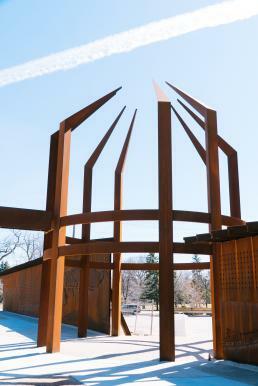 The rust-, silver- and gold-toned wall, which features a sound and light show at different intervals throughout the day, traces the history of Western Canada and Upper Fort Garry from its settlers and the fur trade, to the construction of Winnipeg, even recreating a Métis buffalo hunt. 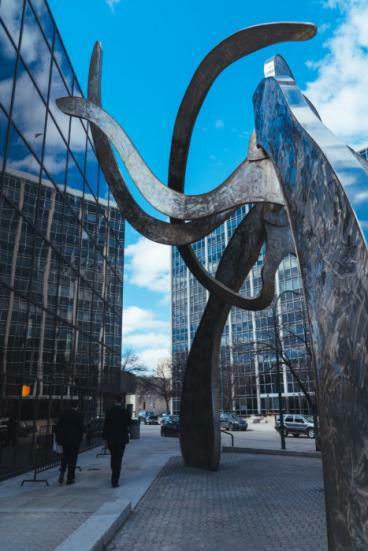 The Justice sculpture at the front of the Law Courts has quite a few interesting features beyond its sheer size and imposing presence that looms over the unassuming passerby. Commissioned to coincide with the 1985 opening of the Law Courts, it’s made of 30,000 lbs. of stainless steel that alternate between shades of slate grey, shiny silver or brilliant gold, depending on the time of day and the light reflecting off its exterior. And reflect it does as Justice catches every single beam of light that hits its majestic structure. What’s even more interesting about this sculpture is that it moves! Despite its grandeur, its creator intended that even a child would be capable of making it move. 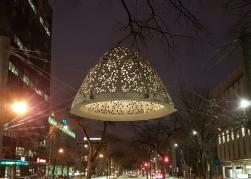 Photo courtesy of the Winnipeg Arts website. Libraries are no longer structures that only house books. Some come surrounded by artistic exhibits that can stir creativity and imagination, in exactly the same way that the books within them do. The Millennium Library and Park are no exceptions. In fact, you hardly need the excuse of returning books to drop by this library. Even before you enter the building, the towering funnelator and its constantly changing light shows will draw your attention, while the Untitled installation of about 1,000 paintings on the interior two-storey wall will keep your mind and eyes busy as you attempt to explore each piece. 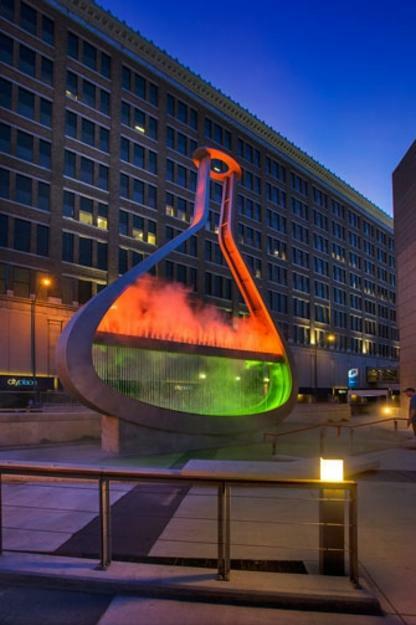 Wander out the back of the library to find Millennium Park, where you can gaze at other eye-catching displays, including the Emptyful beaker. 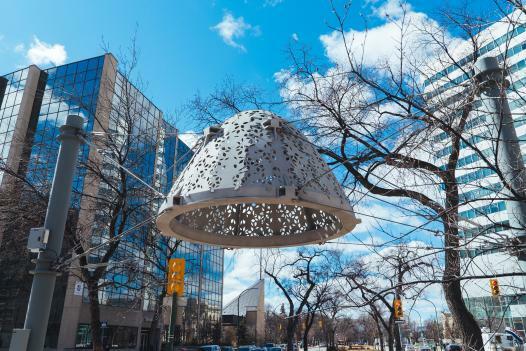 If you’re wondering about Broadway’s latest sculptural addition floating overhead at the corner of Edmonton Street, the dome-like structure is called Heaven Between and it’s one of the latest additions to the boulevard’s landscape. By day, it sits peacefully framing the domes of the Legislative Building at one end and Union Station at the other. 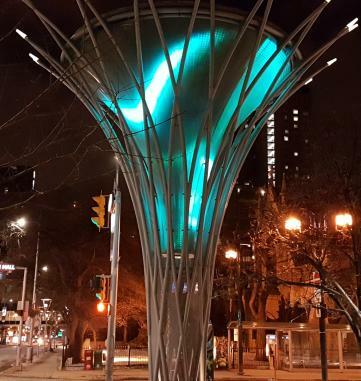 By night, the cut-outs, which are shaped like elm leaves light up the spot reflecting Broadway’s tree-lined stretch. Depending on which corner of the city you’re at, waiting for the bus can be a visually stimulating experience, but the City.Block.Stop. 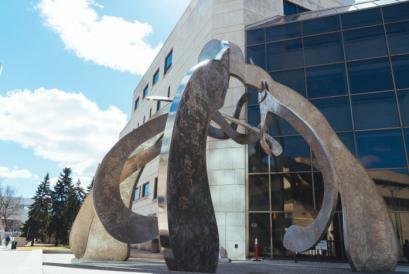 on Ellice Avenue at the north entrance of the University of Winnipeg is intentionally meant to draw in the observer. 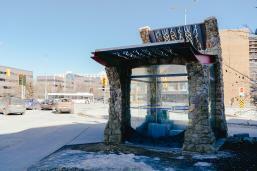 These sculptures are made of a combination of limestone, sandstone, steel, glass and moss – the roof the bus stop is actually covered in ecologically green moss. 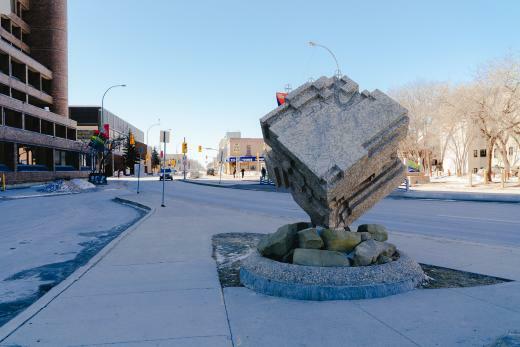 While the bus stop features some trendy blocks that double as seating, the sculpture is representative of the province’s Red, Assiniboine and Seine rivers. Admittedly, it is a hotel, but by day or by night, Mere is a marvel in hip, contemporary design. It’s by no means meant to blend in to its environment. 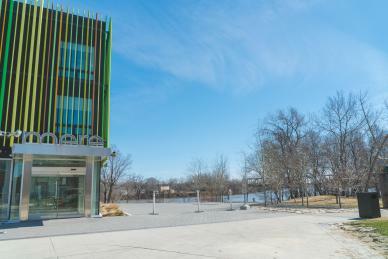 On the contrary, this hotel, on the banks of the Red River quite intentionally stands out along the Waterfront and from everything around it. 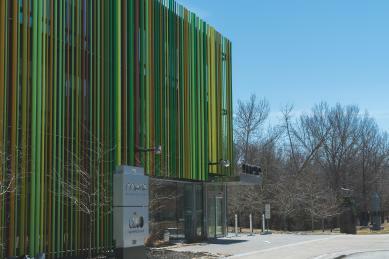 The exterior is made up of vertical, cylinder-like tubes that resemble bamboo stalks – except these stalks come not only in green, but also in yellow, rust, and orange. 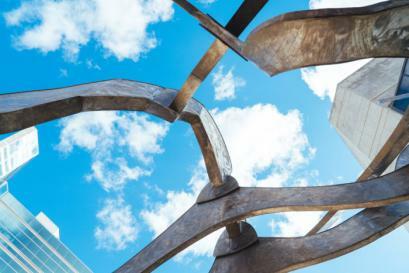 What makes this structure so trendy is its ability to grab your attention regardless of the time or type of day, be it one of inclement weather, or of sunny skies. By night, the colourful “reeds” reflect the light around the hotel delivering yet another take on this artistic display. And if you’re wondering if this hotel’s interior is anything as edgy as its exterior, well you’ll just have to see for yourself.